Lavender and snowy two-toned grips are comfy for extended relaxing rides. The cushioned seat includes lime green trim. 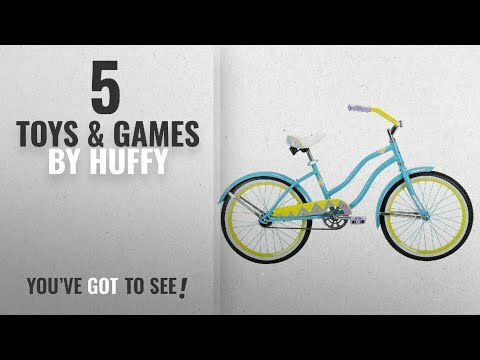 A hardy kickstand and an easy-to-use coaster brake supply the security and assurance Huffy bicycles are famous for. Entirely adorned with fun images, the durable steel cruiser frame is designed to last, and endorsed by our limited lifetime guarantee. The chainguard contains interesting, geometric patterns in shades of blue, lavender, and lime green. 20″ tires have been emphasized by lime green rims and turquoise fenders to keep you protected from the elements. Plus, there is a chair quick release for simple height adjustment. Each of the wonderful images adds up to a single enjoyable bike to ride!